Versa Lifter Band is an innovative solution for laparoscopic organ retraction. It is incision-less and offers effective exposure with the silicone band providing cushioned contact with the liver. Triangular needle with tapered precision tip for optimal tissue penetration. Coated polyester suture for strong traction. Reinforced silicon band for soft contact and high resistance to liver weight. 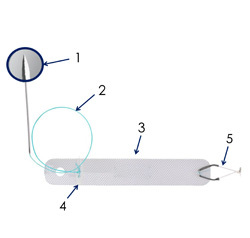 Silicone stabilizing device for band rigidity and stable liver / tissue suspension. Proprietary spring-loaded stainless steel clip for strong anchoring .